The DPX101 series has been discontinued. Please contact our Pressure Engineering department for possible alternatives. OMEGA’s DPX101 dynamic pressure transducers are ideal for measuring pressure transients or dynamic pressure pulsations in liquids or gases. With their wide dynamic range, they can measure pressure events with rise times as fast as 1 µs, frequencies to hundreds of kHz, and pressure levels down to fractions of a psi. Using pure synthetic quartz ­crystals under high compressive preload, these transducers produce a clean, low-impedance voltage signal compatible with many readout instruments. 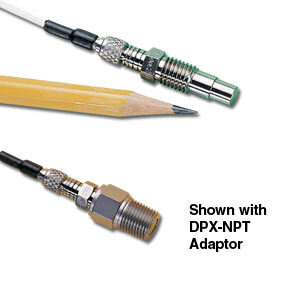 참고: Each DPX101 is supplied with two (2) DPX-6600 seals. A complete system is a dynamic pressure transducer, a power supply, and two cables; one between the load cell and the power supply and one from the power supply to your data system.